Shine the Divine: Creativity IS a Spiritual Practice: "Normal"
I took this photo last January, when I was driving again after a long time of being home-bound...this week I am pretty much bedroom-bound...the earth has not frozen yet, only rain coming down...my health got better, it got worse again...I'm feeling like a wonky barn today...see all the cracks? The pealing paint? I need to peal away my paint, expose my pain a bit...allow the breath of life to flow in and out in this healing space I've created here on my blog. Yesterday in email conversation with a new friend who is also living with chronic illness this is what I was thinking: "normal is not a very helpful word is it? I think sometimes it keeps me caged in comparisons and separate from the moment at hand...because what ever is happening in this moment is "normal", for this moment." Today, the shaking is less violent, but still present...when I make shifts from laying down to sitting...sitting to standing...standing to taking one step....one step to the next. Each shift in body position sets of the shaking of my head, my limbs. My voice is still not the way it was. I have had periods of dysarthria, on and off for many months-usually triggered by heat or fatigue, but after a few minutes of cooling down or resting...it abates. Now it is pretty much constant...although there are moments when it is harder to move my mouth than others...over all I sound fairly drunk...well, neurologically impaired anyway. I just had a really good cry that was building in me, I don't cry often. I'm in a very broken-hearted place...and I understand this as a blessing...a crack in the a heart leaves space for healing to enter, this I know to be true. Gordon helped hand me things in the tub...soap, shampoo...undid the drain so I wouldn't have to bend forward reaching for things. He held my hands as I stood up, promised not to let go as I stepped over the side and found the floor one foot...the other. He guided me to the stool where I sit to dry off. I sat there, my head shaking and shifting from side to side, words difficult to form with my mouth and tongue flowed easily in my mind...and somehow a few tumbled out with my tears. A lot of "I'm sorry's" And "this is so unfair to you and the girls". "I just want you to love me the same...I just want you to know I'm still me"...and I don't know why I even question, for a 100th of a second his love for me or devotion to our sacred marriage...but sometimes I get so scared...maybe I'm really talking to myself....Maybe I need to know that I'm still me....Maybe I need to know that I'll love me no matter what...maybe. I am at the bottom of the mountain looking up again. Every time new symptoms arrive, there is a process of grieving, of realizing that I survived the last onset of changes in my body, got used to them...they became "normal"...and now things are different yet again...maybe the new symptoms will become my new "normal"...maybe they won't go away...Maybe I really am the lady in the wheelchair with the shaking head, twitching limbs, speech that no one can understand because it is so slurred/slow/stuttered/nasal (lets not forget the foreign accent too! )...Maybe I'm that lady that little kids point at in the mall and ask their mommas "what's wrong with her?" and their mommas hush them and whisk them away whispering "don't point...don't stare...I don't know..." The lady in the chair people look at with pity in their eyes and talk to in overly kind high pitched slow loud slightly condescending voices...assuming that the lady in the chair doesn't understand what they are saying...not because they are being cruel, but because they are being kind...they are acting from a compassionate place. I wonder, do they truly see that the lady in the wheelchair twitching is an adult person? (even though she appears small looking down from a standing position) Do they recognize that they too are the lady in the chair? or could be? She is a whole, complete, intelligent person, albeit broken, no maybes about it ... today the lady quaking in the chair is Me. Broken and whole. "...Whenever you use this glass you should reflect that it's already broken. Whenever its time is up, it will break. Use the glass, look after it, until the day when it slips out of your hand and shatters. No problem. Why not? Because you saw it's brokenness before it broke!" ***please read Toni's book to learn how she has taken this teaching and crafted a healing practice through it!!! She's amazing...you have to get to know her, learn from her...I cannot recommend her book enough!!! I could get better in a few days...back to my last "normal". I hope so, I pray that it will be so...but I might not. My experience has been that each time a new set of symptoms appear, there is some kind of lasting residual. And yes that makes me sad. And I also know deep down that the sadness will shift to acceptance and that there is room for sadness along with joy and anger and love and confusion, frustration, disappointment, satisfaction...room for all of it in my broken-body, broken-myelin, broken-heart. And this is the way of all living things, in our own time, we break. This is where I am today. This is what I am living through in this moment. It's important for me to look at this fear...scared and sacred are comprised of the same letters...the fear is holy, it is a dark place I must enter from time to time...pass through so that I can continue to grow, accept, love my body as it is today...not yesterday, not tomorrow, today. For today...this is my "normal". This is raw-writing...no editing ...catharsis. Writing is a good place for catharsis, I've found. To get it all out, from where it's trapped in the mind and heart, to set it down and look at it and somehow "free" yourself from its shackles in doing so. I'm crying with you, in your broken-heartedness, your bottom-of-the-mountain looking up, your "I'm sorrys" to family, your waiting to see what "normal" will look like. I've been where you are today. I understand it intimately. And I'm praying with you, for grace in this day. Raw, real, beautiful and powerful. Just like love, truth, the Divine and you. Blessings on your path, Laura. Your raw and unedited writing is so eloquent, so powerful. It brought tears to my eyes. All good blessings to you. Like me, you are broken and you are whole. Normal is what you are, it is a self defined condition as we see it for our self; For truly you can only compare you to yourself, as no one else lives in your normalcy. Sometimes we have to be wonky or broken before we can be fixed. except for your self-descripters I would never know from your clear, concise, well-storied writing voice that you are in such straits. I imagine it to be like layers and layers of clothing - and I do SO hope you will be able to shed this latest burdening and find relief from a cumbersome claustrophobic and unwanted garment. and under it all - yes, you are you. How do I continue to thank you and to let you know how much your writing means to me, how much I learn and grow and experience new ways of seeing? I read of the wonderful Broken Glass teaching recently again in Happy Yoga, too. Great teaching. We are One, all part of the Divine Consciousness and so, yes, we are you, too. I remember learning in my old catechism classes: when any part of the Body of Christ hurts, it affects the entire Body. (We can substitute Divine or Love for "Christ" as preferred.) Your tears fall on my heart, too. And so, I send you my healthy energy, my non-shaking energy, the strength and grace and health that I feel this day to you. And I pray that when I need it, that you will also send it to me. We are Love, temporarily housed in a physical self, learning and growing, evolving into our highest and greatest good. Your words are so beautiful and powerful that I can't find the words for the comment it deserves. Your body may be broken but your mind and soul is as beautiful and normal as it could ever be. I send you love and peace, blessings and may you find your desired normal. and I am just here. it is an honour to read this , it truly is. I will light a candle of think of you today sweet Laura. The gift you are to all of us cannot be underestimated, Laura. Your eloquent and soul-filled writing reaches out and grabs our hearts, opens our eyes and renews our commitments to our own lives, our own journeys, in Holy ways you cannot know. You are a Blessed Warrior and purveyor of Light and Love. God be with you always. Laura, I think you are brave, heroic, to share these things. I want to help. I think this might, that might...but what do I know? Surely you have tried everything. So I thank you for being a hero, and I pray God will bless you right now, right where you are, and just as you are. May you feel the warmth, and see the light, of His love. In Jesus' name I pray these things. I have been musing over what you have written here. Most of us will someday struggle with our body's betrayal, though we hope not as early in life as you have. Now that I have reached the magic age of 65 I often wonder, how gracefully will I deal with the loss of a body able to do whatever I ask of it? Your generosity in sharing your thoughts helps the rest of us in accepting the changes that are bound to occur. oh you are so very whole, Laura. this raw, touched something deep in my core, you've touched my heart dear lady. thankyou for your soulful expression, your honesty. p.s. 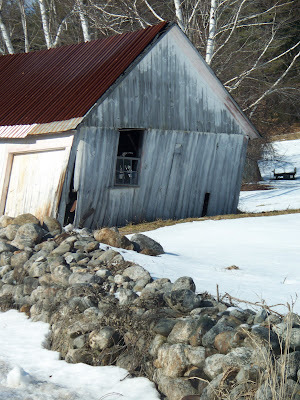 love the pic of the barn.. i feel a little lopsided most days, leaning either one way or the other..trying to balance. Hi Laura -- I very much enjoyed your post here -- and I plan to come back to read more later. I'm glad to have found your blog. We can look at it as everything is already broken, or we can look at it as everything is as it is meant to be. It is amazing writing to read and I'm so honored by your willingness to share. I love the wonky barn with all its character and rustic, broken beauty. I appreciate the reminder that we're all broken. I'm sad for your broken heart and breaking body. Your words of sadness and loss just took my breath away. You are so strong and wise and beautiful despite your many obstacles. You and that wonky barn show the signs that your life's hard journey have left on you, and you still manage to reach out and teach us what is important.